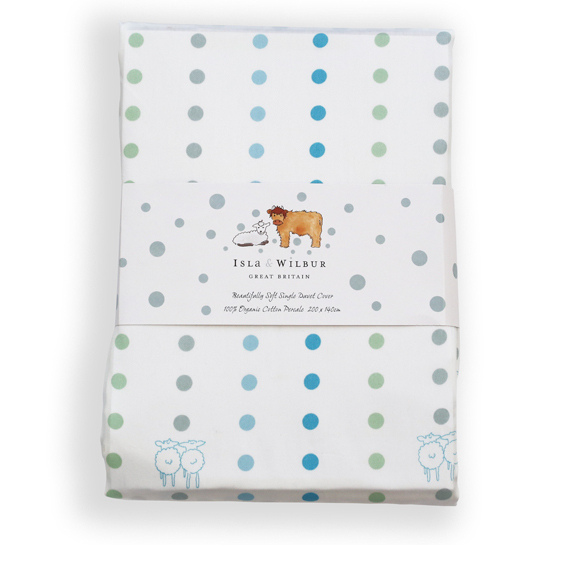 The luxury single duvet covers from Isla & Wilbur are a fantastic addition to any childs bedroom. Each duvet cover is made from 100% organic cotton percale and woven to a 300-thread count. The single duvet covers are available in 4 designs. Raspberry spots, Blue spots, Raspberry Twin sheep and Green Twin Sheep. Each cover is available with matching fitted sheet and pillow case to complete the look. The duvet cover will fit duvet size 140 x 200cm. Each duvet cover will be delivered via First Class Royal Mail.